One of the oldest and most potent natural stimulants, the leaves of the coca plant are the organic source from which cocaine is synthesized. Fresh coca leaves and products made from them have verified medicinal and healing properties--and not the same addictive qualities or negative side effects as cocaine. In the late 19th century coca products became hugely successful in Europe and the United States. The most famous was Vin Mariani, a coca-based tonic wine developed by Corsican pharmacist Angelo Mariani (1838-1914). Many celebrities sang its praises, including Pope Benedict XV, Sarah Bernhardt, Thomas Edison, H. G. Wells, and the doctors of Ulysses S Grant, who credited Vin Mariani with giving him the strength to finish his memoirs before his death. 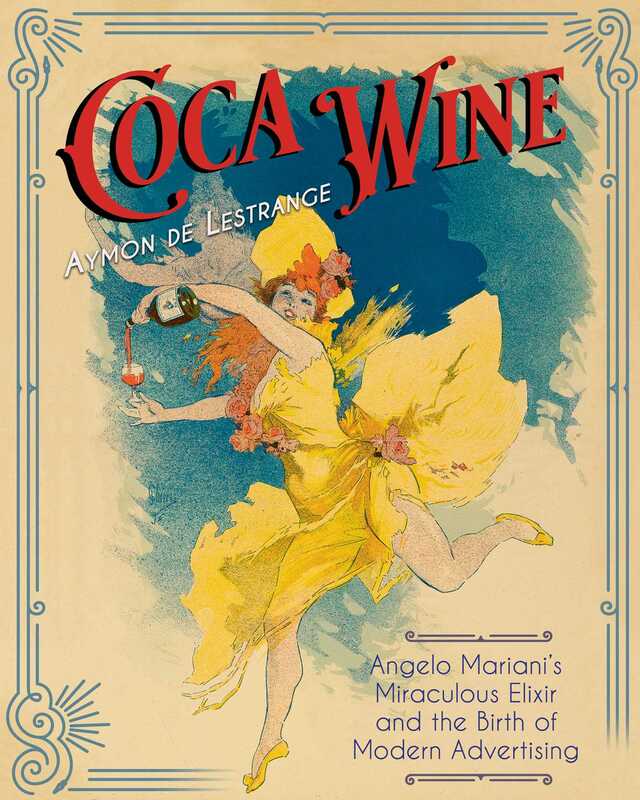 In this full-color illustrated history of coca wine, author Aymon de Lestrange follows Mariani’s interest in coca from its medicinal applications as an anesthetic to the creation of the tonic wine. The author explores the botany of coca, how it differs from cocaine, its traditional use in pre-Columbian America, and scientific studies on coca from the 17th through 19th centuries, including from Sigmund Freud, who was a known user. Looking to the future of coca, the author shows how it has gained renewed interest in the scientific community for its therapeutic and nutritional properties and in the spiritual community, which is seeking to rehabilitate the reputation of coca, the sacred plant of the Incas. It is the tragic story of U.S. President Grant that made Mariani’s wine famous in the United States. Since the summer of 1884, Grant suffered terminal throat cancer. Wishing to leave money to his family, he decided to write his memoirs. His doctors administered him Tea Mariani or Vin Mariani which relieved his pain and nourished him when he could no longer eat. In doing so they were able to extend the life of their illustrious patient for a few months so he could finish his book, completed just few days before his death. Americans became soon impassioned by this race against death. At the request of a number of prominent physicians who desired to get from him personally a better understanding of the nature, preparation, and administration of this wonderful medicine. In the case of General Grant, the physicians have found the merits of Vin Mariani to be all they could have expected. Mariani published several monographs in the United States on coca and Vin Mariani, which contained, among other things, extracts of French and American medical articles and testimonials of doctors advocating his products. Among these, we can mention the father of spinal anesthesia, Dr. Leonard Corning, who wrote in 1884 that “the preparation of coca known as Mariani’s Coca Wine is, so far as I know, the best in the market. It possesses the decided advantage of being manufactured from the fresh leaves which is an indispensable requisite.” He recommends it in cases of great depression. The Health Commissioner of New York City, Dr. Cyrus Edson, in his work on influenza recommends Vin Mariani as hot grog. Professor of Clinical Medicine at Bellevue Hospital in New York, Beverley Robinson, recommends its use as a heart tonic, because of the excellent quality of the coca leaves. The plant and its therapeutic use were studied in the U.S. later than in France. Except a first article in 1861, and a second in 1870, it was not before 1876 to 1877 that several medical articles were published. (6) Their amount increased in 1880, along with the creation of the Therapeutic Gazette by the laboratory Parke Davis in Detroit. This journal published nearly twenty articles on coca between 1880 and 1884. They became one of Sigmund Freud’s most important sources for the writing of his 1884 article “Ueber coca.” One of the first indications highlighted in many of these articles was the treatment of the addictions to opium and morphine or alcoholism by coca. Before becoming the great laboratory of production and sale of cocaine, Parke Davis proposed in its catalog of 1885, six coca-based products: the fluid extract of coca, coca wine, coca liquor, coca cigars, coca cigarettes (for respiratory ailments) and coca oil at 5% (to treat neuralgia). American coca imports exploded between 1884 and 1900, rising from 25 tons to 500 tons. The name Mariani became known to all. People were writing him from around the world. In France, his coca wine was on the tip of everyone’s lips. So much so, that after the influenza epidemic of 1889 in Paris, his wine was one of the most highly recommended drugs. Charles Fauvel had even humorously called it “the lightning rod of the flu,” to be used as grog by mixing it in hot water and sugar. Dr. Lieberman, Surgeon-in-Chief of the French army, said to have used his Mariani wine: With great success for profound anemia resulting from long and tedious campaigns in hot countries, and accompanied, as is nearly always the case, by gastrointestinal irritation with loss of appetite and dyspepsia [...] I have also employed it in cases, happily rare in our army, of chronic alcoholism, resulting from the abuse of brandy, absinthe or strong liquors [...] I have frequently seen hardened drinkers renounce their fatal habit and return to a healthy condition. I have also used Vin Mariani to save smokers of exaggerated habits, from nicotinism [...] I have also employed it with success for chronic bronchitis and pulmonary phthisis [consumption]. Vin Mariani increases the appetite and diminishes the cough in these two morbid states [...] Besides I have used it to the greatest advantage in convalescence from typhoid fever, when no wine, not even Bordeaux, was retained by the stomach on account of gastric irritation which is the rule after fevers of this nature[...]. Daily newspapers, over the years, multiply the articles on Mariani’s products and their therapeutic properties. In 1909, Le Figaro reports that the American explorer Robert E. Peary (1856-1920), had taken the precaution to bring with him, during his expedition to the North Pole, several cases of Vin Mariani. Aymon de Lestrange has degrees in literature and history. He served as an Information Officer at the United Nations Information Center and Cultural Attaché at the French Embassy in Lima, Peru. A bibliophile, publisher, and collector, he is well-known for his important collection of drug-related items, including the most comprehensive collection on Angelo Mariani and coca items in the world. He lives in Paris, France. "Impressively informed and informative, beautifully illustrated throughout, notably comprehensive, exceptionally well written, organized and presented for both academia and non-specialist general readers with an interest in the subject, Coca Wine: Angelo Mariani's Miraculous Elixir and the Birth of Modern Advertising is a unique, extraordinary, and highly recommended addition to community, college, and university library collections."